This Cheesecake Streusel Raspberry Cake recipe is a keeper! 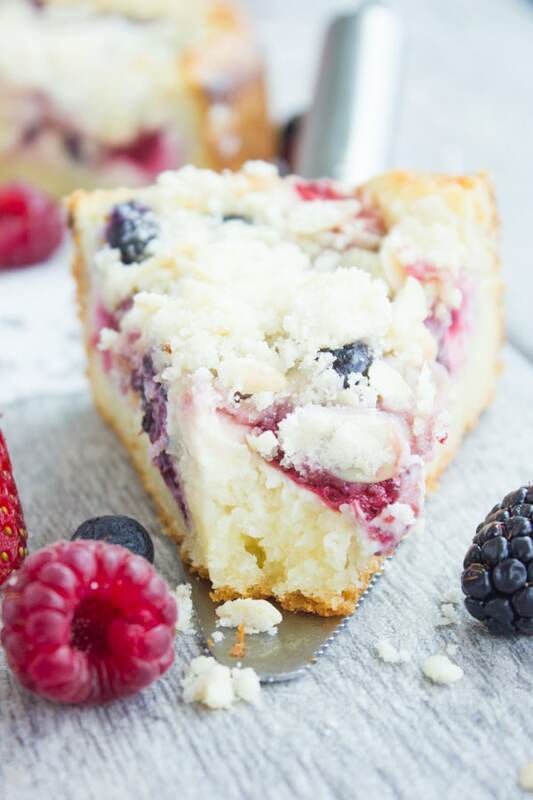 Picture a buttery layer of vanilla sponge cake, topped with a thin layer of vanilla cheesecake, fresh berries and a generous amount of buttery almond streusel crumb. It’s hard to just say this is the best Cheesecake Streusel Raspberry Cake recipe. Because it is also absolutely the best streusel cake, raspberry cake and coffee cake ever! Picture this Cheesecake Streusel Raspberry Cake as a buttery layer of vanilla sponge cake, topped with a thin vanilla cheesecake layer. Now if you’re thinking you’ve seen quite a bunch of raspberry recipes on the blog already, I don’t blame you! But it’s berry season and I can’t help but pick up some fresh raspberries each time I am supposed to be shopping for something else. To start off, it has this almost hidden layer of cheesecake—and you know how I’m in love with cheesecake from these mini raspberry cheesecakes! 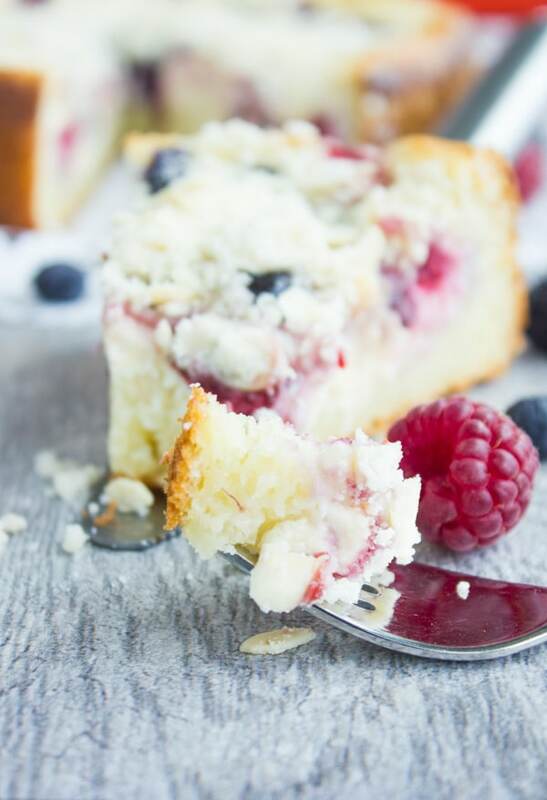 This cheesecake layer compliments the buttery cake and the berries so beautifully and adds a creamy silky feel to the cake. The berries when baked still retain some texture because they’re hidden under the streusel and so they add plenty of sweetness and flavor. The cake batter in this Raspberry Cake is so buttery, so tender and dense enough to make the perfect base for all the layers that top it off. The raspberry cake batter is prepared by grating cold butter into a flour and sugar mixture. Then, part of this butter-sugar-four mixture is set aside and mixed with almonds to create the buttery streusel topping. The remaining butter-sugar-flour mixture is mixed with eggs, sour cream, baking powder and baking soda to form the cake batter. The cheesecake layer is a simple mix of cream cheese, vanilla, sugar, and eggs. This mix is spread evenly over the top of the cake batter leaving just an inch border. Next, we sprinkle the berries on top. For this Raspberry Cake, I used strawberries, raspberries, blueberries, and blackberries. That way, we have a mix of blue and red for the 4th fourth of July! Feel free to drizzle a couple of tablespoons of raspberry jam on top of the raspberries for extra sweetness. 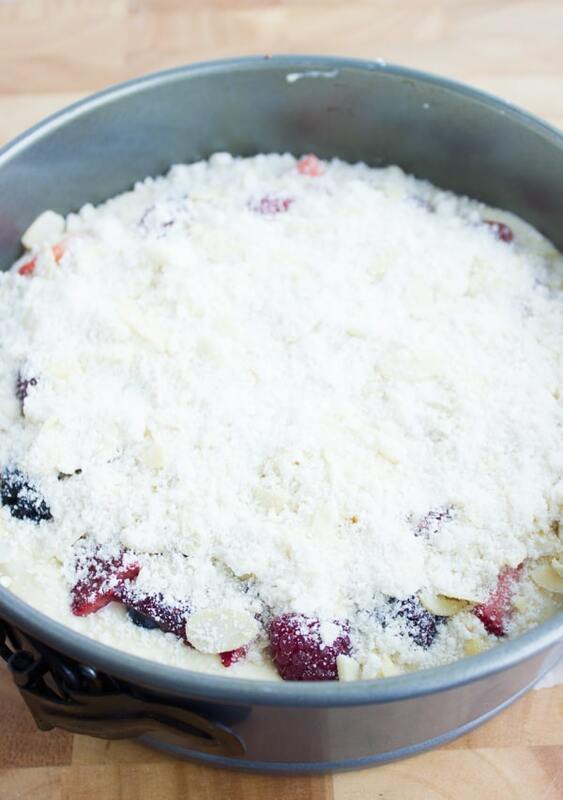 A final sprinkle of the almond streusel goes on top of the berries! Now this Raspberry Cake is ready to go into the oven! Bake your Cheesecake Streusel Raspberry Cake for 50 minutes until done. Once this raspberry cake is baked, the streusel topping becomes slightly crunchy. Also, the berries will wilt a little and concentrate in flavor. The cheesecake layer will harden and sticks to the buttery tender cake layer. Just like that, you’ve got yourself a piece of cake art to look at and the absolute best Raspberry Cake to savor, share and enjoy! I’ve made this raspberry cake so many times with just raspberries. Sometimes I mix in some blackberries or blueberries. 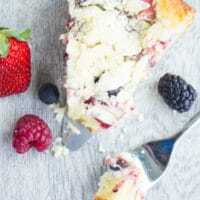 You can use your favorite berry combo for this Cheesecake Streusel Raspberry Cake. Add a dollop of raspberry jam on top of the unbaked raspberry cake. 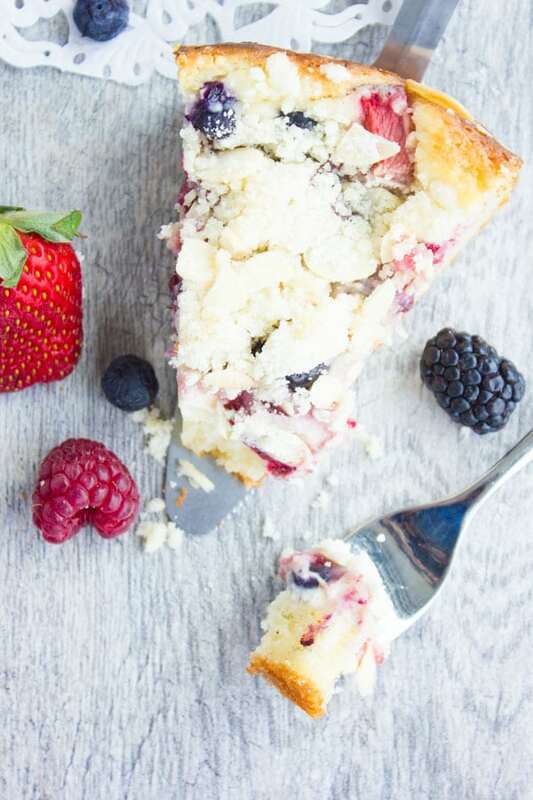 This adds just an extra layer of sweetness to the berries. Serve it with whipped cream for the ultimate indulgence! In a large bowl, place the flour and sugar and mix them well. Then add in the grated butter, mix well and remove 1/2 cup of this flour-sugar-butter mixture into a separate bowl and add to it the almonds, then set aside. To the remaining mixture of flour-sugar-butter, add the baking powder, baking soda, pinch of salt, sorcery and egg and whisk well. Pour the cake batter at the bottom of a 9-inch springform/cheesecake pan (this is the best pan for this cake). 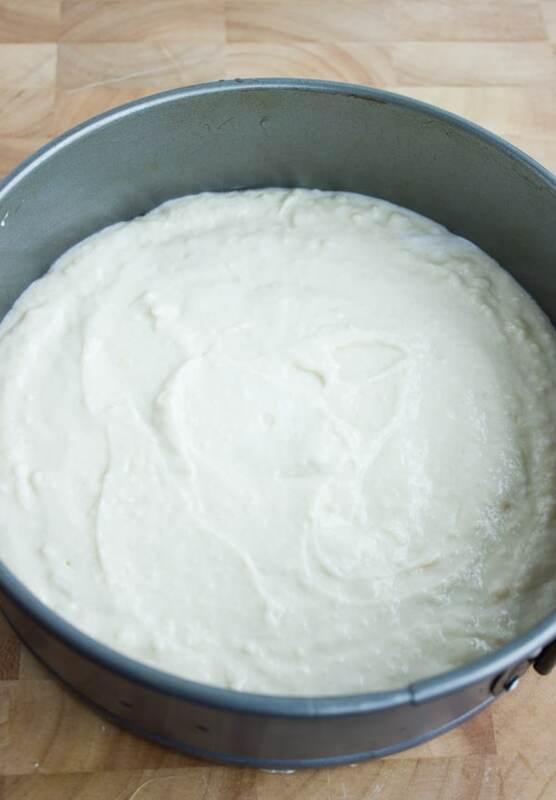 In a small bowl whisk the cheesecake ingredients until smooth and put over the cake batter leaving about an inch border all around the cake so that the cheesecake layer doesn’t burn. 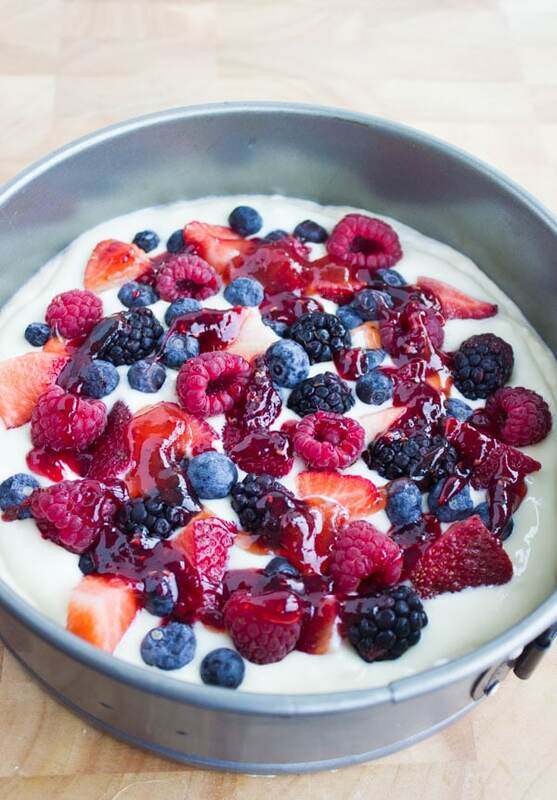 Top the cheesecake layer with the berries and dollop the jam if desired. Then sprinkle all the streusel topping over that and bake the cake for 50 minutes until done. I’ve made this raspberry cake so many times with just raspberries, but sometimes I mix in some blackberries or blueberries. 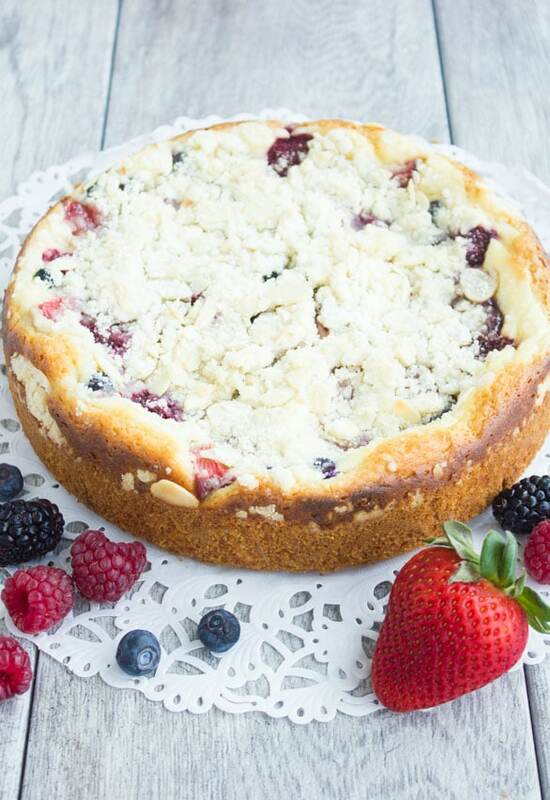 You can use your favorite berry combo for this Cheesecake Streusel Raspberry Cake. Add a dollop of raspberry jam on top of the unbaked raspberry cake to add just an extra layer of sweetness to the berries. Yes Kathy!!! Thanks for pointing that out and Thank goodness it was obvious to you!